When it comes to dental practice marketing, it’s easy to focus more on new patient acquisition rather than on how to strengthen your existing relationships with current patients. While new patients help a practice grow, developing and nurturing a dedicated and reliable patient base is how every practice thrives. With the warm air of summer slowly starting to fade into fall, the holiday season will be here before you know it. Kicking off the fall festivities is the sugar addict’s favorite holiday and the one the parents dread the most – Halloween. Studies have shown that 7 out of 10 parents wish their kids received less candy and more sugar-free alternatives when collecting their score while trick-or-treating. No one apparently wants to be the only house on the block handing out sugar-free gum and dental floss, as Americans spent $8.4 billion on Halloween candy in 2016, an all-time high. To answer the needs of parents – and get your dental practice some free publicity – your practice should consider running a candy buyback program this year. Kids sell their extra candy to your practice for a set amount for every pound. A monetary reward makes the idea of not eating every single piece of candy a little more palatable to kids, and the chocolate you collect then gets donated to a good cause. From a dental practice marketing perspective, not only does this kind of program help to improve some of your most vulnerable patients’ health, it also demonstrates to your current and prospective patients that you’re a practice that’s dedicated to the needs of the community. Step 1.) Name your event. Candy buyback programs are a well-established marketing practice this time of year, and it’s possible you won’t be the only dentist in town who plans to implement a similar program. To avoid confusion, and to make sure your program is the most memorable, you need to create a catchy and distinctive name. Make sure to include your practice name in order to get maximum brand exposure. Step 2.) Set a date. The majority of buyback programs are scheduled to be held the first week of November or the day after Halloween. Choose the time and date as soon as possible, so you can provide your staff with plenty of time to prepare and instruction on how the program will be handled. You will also need to schedule accordingly to make sure you have enough time and staff on hand to accommodate the kids and candy. Ideally, you want few, if any, appointments during the set buyback time so you can interact with the patients as they come in to better improve these relationships. Step 3.) Set your price. Candy may be worth its weight in gold to kids, but you’ll only need to offer about $1 a pound. Some practices offer a small gift instead of, or in addition to, money, such as toys, gift cards, superhero-themed toothbrushes, and other appropriate types of rewards. Step 4.) Who gets the candy? Once you’re candy rich, you need to select a local charity or community organization to gift all of that chocolate to. An easy answer is to donate the candy to Operation Gratitude, a nonprofit that sends care packages to active members of the U.S. military and their families. You can pack up the candy, fill out a donation form, and ship it off to those brave men and women in the armed forces. Additionally, there are many local organizations that would also be happy to accept your delicious donation. One idea you might explore is to donate the candy to a local children’s hospital where it can be given out to kids who were unable to trick-or-treat this year. Step 5.) Preparation is the key to running a successful buyback. If you plan on offering toys or prizes in exchange for candy, make sure to purchase them well in advance of the event in order to avoid any last minute surprises. You will also need to have a few basic supplies on hand, such as a scale to weigh the candy, large bins for candy collection, and some decorations to help create a festive environment. Don’t neglect to have plenty of business cards or promotional materials on hand to give out to parents whose kids have come to sell candy but who are not yet patients. Hosting community and charitable events offer a unique way to implement your dental practice marketing strategies, because they allow you to reach a different audience than what’s available through normal advertising. Generate buzz, get people within your community talking about your dental practice, and establish your place as an active leader within the community. Issue a press release that includes the time, date, place, beneficiary, and other relevant event details. Once the buyback program is over, issue a second press release that includes the number of kids that participated, amount of candy collected, and any other interesting and relevant details. Reach out to local television and radio stations, as well as social media influencers in your community. Ask them to announce the event, and encourage them to attend, if possible. Make sure you reach out to any T.V. or radio programs that feature local interest stories. Notify all schools, parent groups, and children’s organizations in your community about the upcoming event. Community, newspaper, and trade group websites all typically feature an events calendar section. Make sure your buyback program gets listed. Heavily promote the event through your own social media channels. While it can be difficult to get patients to share or “like” practice advertisements, you’ll be surprised how excited many are to discuss fun and interesting community events. Halloween candy buyback programs are incredible easy to organize, and can be easily expanded if needed. Some practices even hold raffles or offer prizes to increase patient turnout. For example, you could offer a gift certificate to the family that exchanges the most candy or prize to the child that collects the most donations. You can also incentivize local clubs, teams, and school groups to participate by offering a prize to the largest group donation. If you want to expand your event without reaching further into your own pocket book, team up with other neighboring dentists, pediatricians, or nutritionists to share the costs of the buyback. You can even reach out to other types of businesses in the community about making a donation or teaming up for the event. Don’t let another Halloween pass without taking advantage of this easy and incredible popular method of marketing your dental practice to the community. Click here to find out how Local Fresh can help you organize and promote your next candy buyback program. 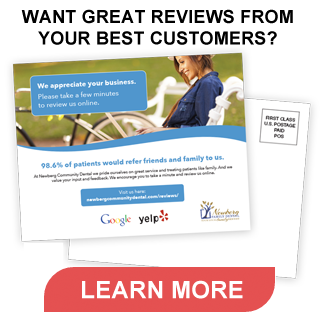 ← Your Local Search Rankings are Great, So Why Are You Failing to Attract New Patients?